Just like in life, there are many ways to make it work. Here’s my way! Mix the diced tomato and red onion together and season with salt and pepper. Set aside. To make the guacamole, scoop the flesh out of the avocados and into a bowl and mash well. Mix in the coriander, half the lime juice and some salt and pepper. Fry the chorizo in a dry frying pan set over a medium heat for about 5 minutes, until it has started to release its oil and catch a little colour. Remove a few pieces for garnish, then stir in the refried beans. Heat a little olive oil in a frying pan set over a medium heat, then fry the eggs sunny side up. When the eggs are nearly ready, sprinkle over the grated Cheddar and cover with a lid to help the cheese melt over the eggs. 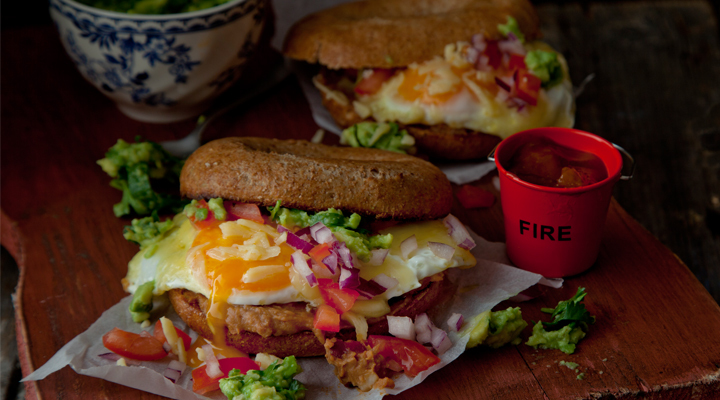 Divide the refried beans and chorizo between the toasted bagel halves, then place a cheesy egg on top, followed by some of the tomato and red onion salsa, a dollop of guacamole and the reserved chorizo. Finally, squeeze the remaining half of the lime over the top. For an extra kick, drizzle with hot sauce.